KOGUVA, MUHU ISLAND, ESTONIA–We are spending our first night together in a small model village (N58.59638°, E23.08559°) designed to show what farming life was like in 19th century Estonia. Our rooms have rough-hewn wooden walls, rope mouldings, and iron bedsteads. We’re a bit concerned that we will have to milk cows before breakfast. The weather is simply perfect. 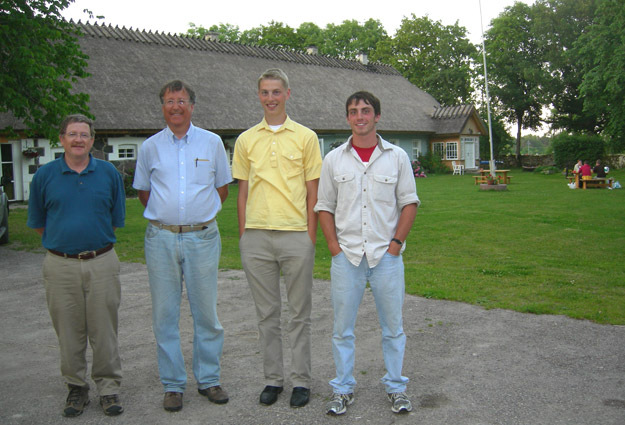 In the photo below you see Bill Ausich (on the left), a paleontologist from The Ohio State University, Mark Wilson, Palmer Shonk, and Rob McConnell. You may see Rob in these clothes for awhile. In his epic journey here from Montana, his luggage has yet to arrive! It is good everyone made it safely! I’ve enjoyed your posts so far this summer Dr. Wilson and I hope you have a great experience and many adventures in Estonia. I look forward to follow you on your journey through your blog. Take care!